A properly cooked fillet steak is a joy to enjoy. 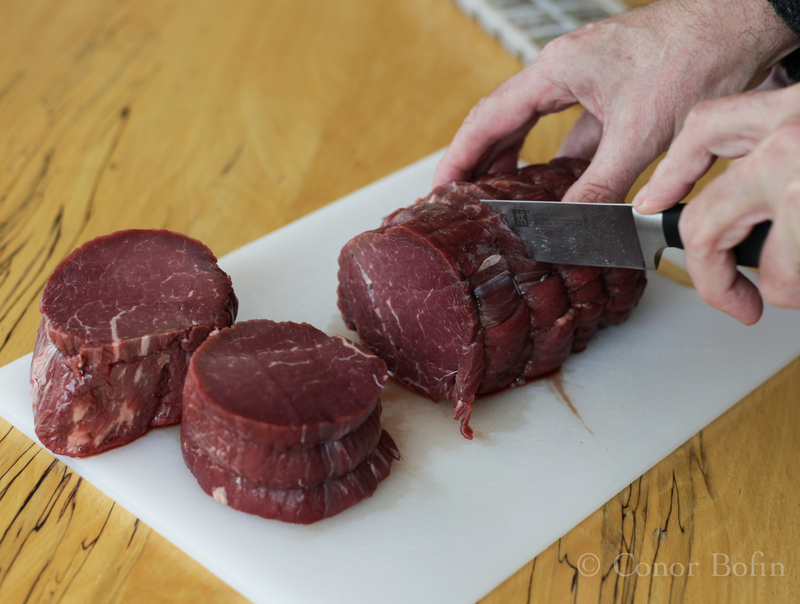 Cooking a fillet (tenderloin) is not difficult either. 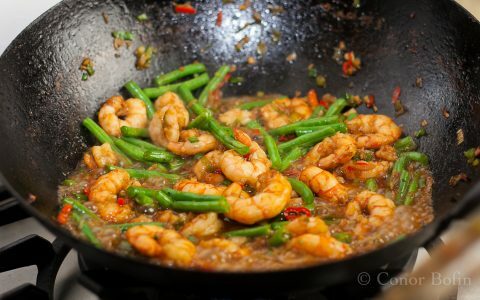 Simply sear it on either side and throw the pan into a hot oven for a few minutes and the job is practically done. 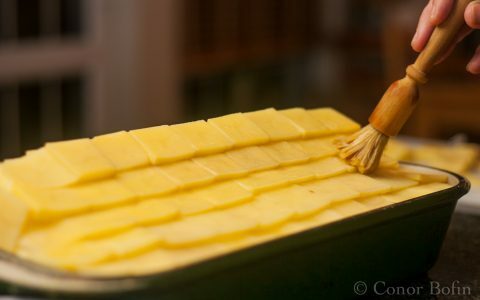 You can complicate the process and clog your arteries by finishing it (and yourself too) with butter. I have never seen the need to do this. A good fillet is a good fillet. Right? Wrong, I’m afraid. Very wrong. Particularly so if one cooks the steak sous vide and makes a lovely red wine sauce to enjoy with it. While the steak is pretty straightforward to prepare, the sauce requires one to play the long game. 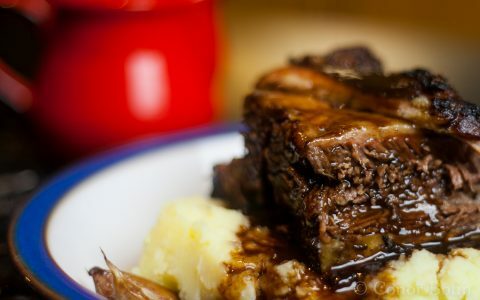 The combination of a highly concentrated beef stock (demi-glace) and some good quality red wine makes for an unforgettable sauce. A half-assed ingredients shot. I forgot the butter, the salt and the pepper. That’s a half bottle of wine, not a huge steak. In fact it is a huge steak, just beside a half bottle of wine. The ice-cube tray contains previously made beef demi-glace.Apart from the missing ingredients (butter, salt and pepper), that’s all one needs. Do bear in mind that the demi-glace takes three days to make. It is essential to this dish. So, unless you have already made the demi-glace, you can’t have this for your dinner any day soon. Let’s start with the steak. It’s hard to be mean when slicing up this huge fillet. A lesser mortal might have got 8 servings out of the big fillet. I couldn’t help myself. We were five, so five it was. 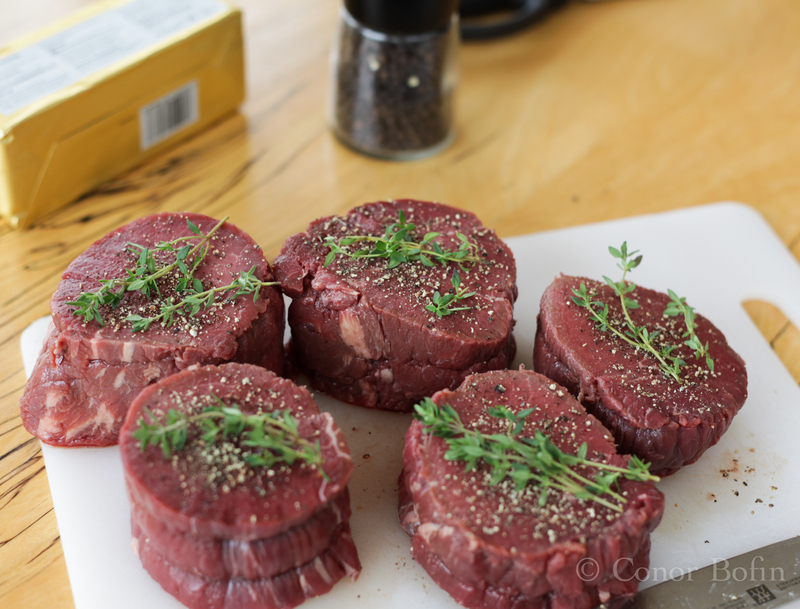 Once sliced, season the steak on both sides with black pepper. Not too much. Add a sprig or three of thyme. The deep red of he beef and the green of the thyme look lovely. They taste great too. 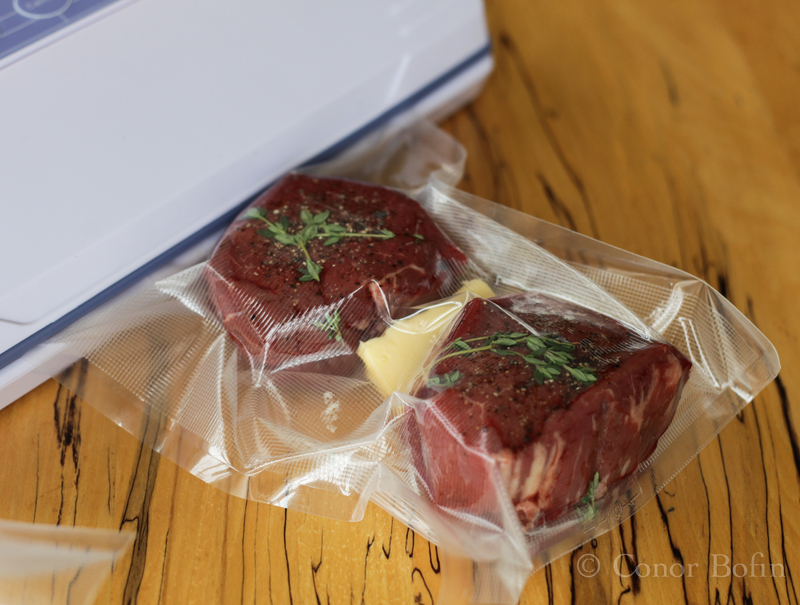 Place the steaks, along with a knob of butter, in bags and vacuum seal them. So little preparation. It seems almost too easy. 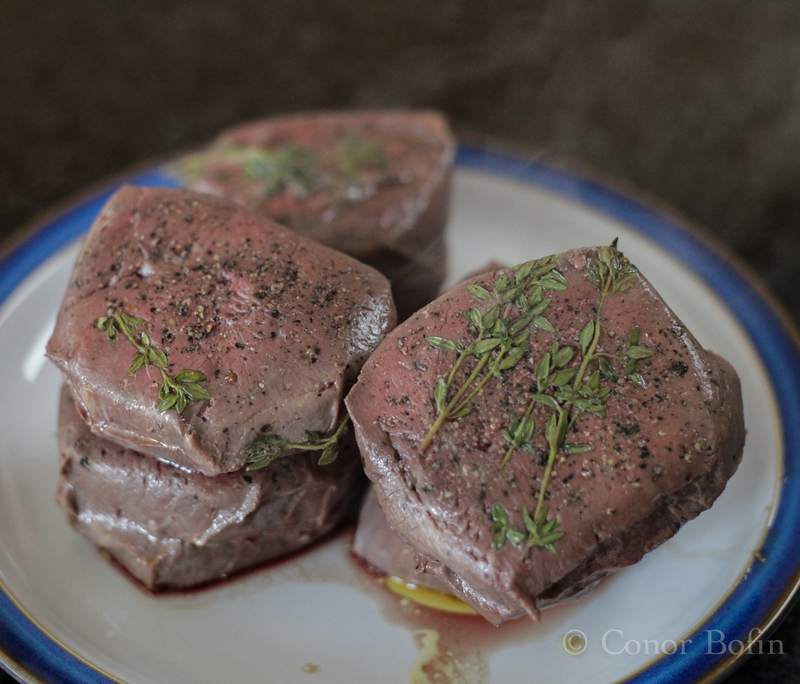 Next, it’s into the sous vide bath with them for two hours at 55ºC. While the beef is slowly cooking, slice up four shallots and two cloves of good garlic. Slice them nice and small. Fry them, in a bit of butter, over a medium heat until the shallots are just about translucent. That’s about translucent enough for me. 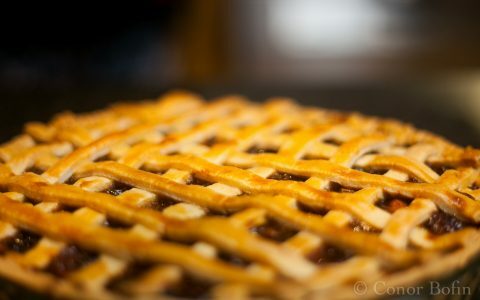 Add a glass and a half of good wine. 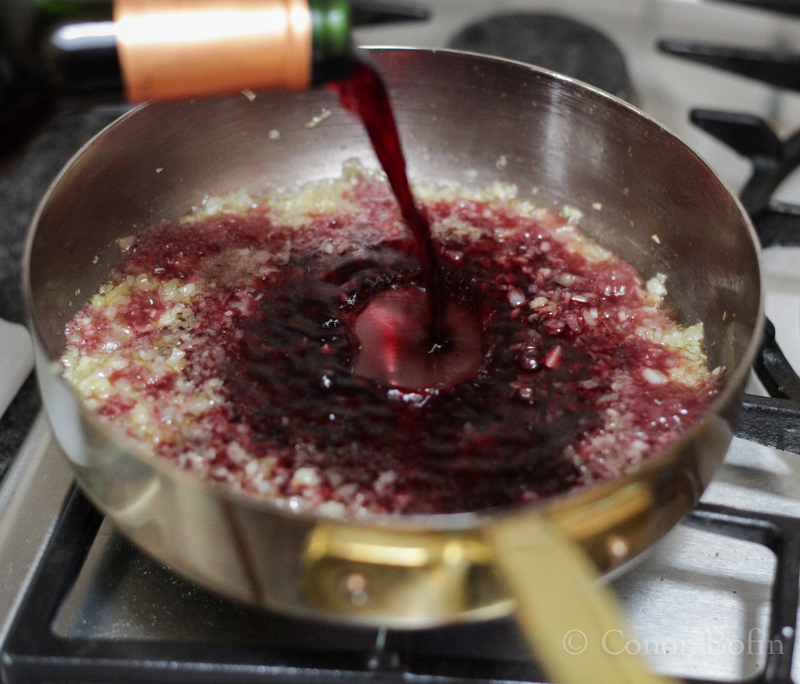 Side note on cooking with wine: Don’t be an idiot when it comes to cooking with wine. Use the good stuff. If you intend drinking a half decent wine with your steak, use that wine in the sauce. This will harmonise the meal. It will act as a flavour bridge between the beef and the wine. You will have a far more balanced meal than if you play the tightwad and use cheap wine in the cooking. If you intend drinking cheap wine with a fine fillet steak, go read something else. You are not wanted here. Go on ya’ tightwad, pour it in there! Bring this to a gentle boil, to ensure all the alcohol evaporates. It will be gone by the time the wine starts to bubble. Add the beef demi-glace. Mine was frozen in ice-cube trays. It doesn’t look like much. But, it really is bursting with flavour. Bring the sauce back to a gentle boil. 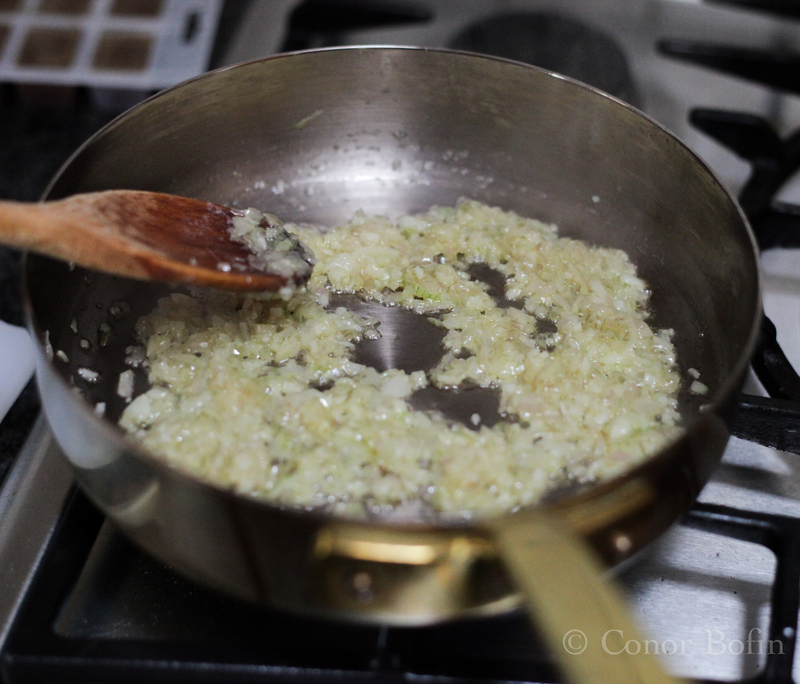 When you feel that the shallots and garlic have got their flavour into the sauce, sieve them out. I had simmered mine for about ten minutes before I thought it was right. By making your own call on this, you will have created a sauce rather than followed a recipe by some Irish bloke. Then, it’s all yours! Reduce the sauce by about half. put it to one side. Take the beef out of the bags and remove the thyme. Heat some oil (or butter if you must) in a frying pan and brown the beef on both sides (and the edges, if you have the time and inclination. Remember, the beef is cooked (medium rare) and only needs a quick browning. They really don’t look like much. They are so tender, they are difficult to lift. Put the sauce back on the heat. Add a knob of butter to thicken the sauce. 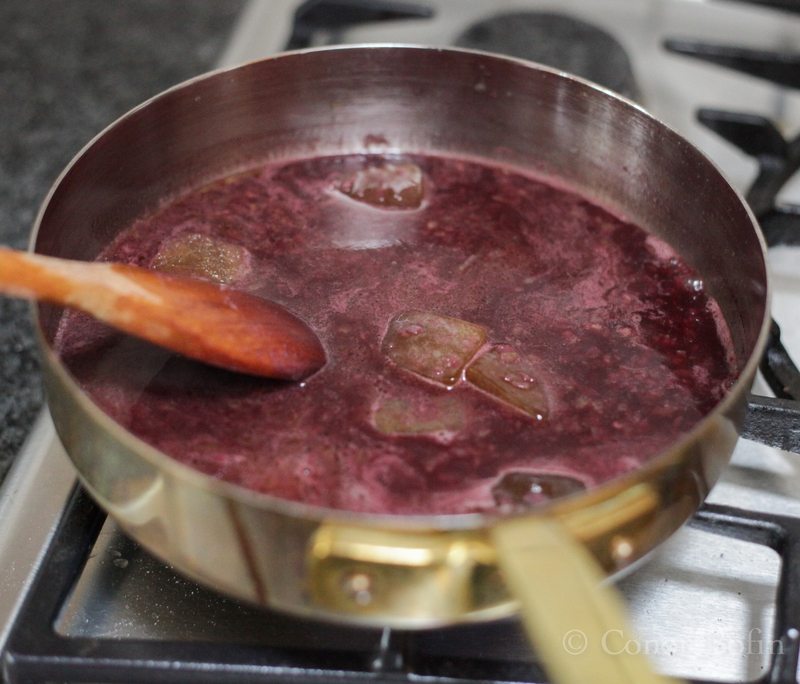 This will also give it a nice extra taste dimension and will make the sauce silky smooth and shiny. Serve the steak with whatever vegetables you feel appropriate. Pour as much of the sauce as decency allows over your steak. 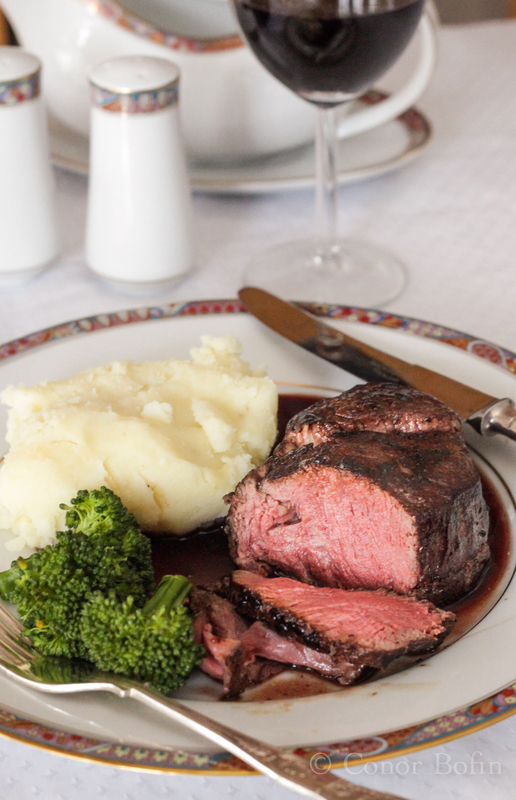 Beefy, winey perfection on a plate. The beef was probably better than any fillet I have ever tasted. It was perfectly medium-rare from edge to edge. The sauce was an amazing, deep flavoured delight of deliciousness. There is no argument on this one. Fillet steak sous vide is fantastic. The sauce raises it to truly wonderful. 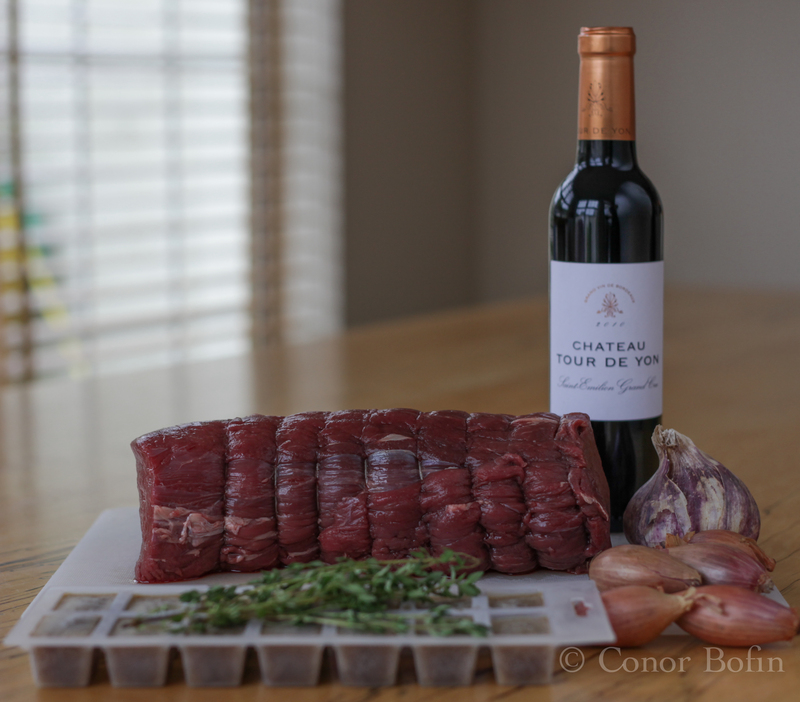 When one adds the Chateau Tour de Yon to the equation, it makes for a meal too tasty for superlatives. Getting Lots by Giving a Little. Paddy Goes To The Big Smoke. It's Smoked Chicken in "Hot Irish" Brine. Looks stunning. Another fine dish from Mr B. It was pretty good, if you will forgive the flagrant self congratulation. Too many “ifs” in there Kate. You can dispel most of them (bar the headache one – ouch). Yes, that one’s a bit of a killer. The Husband and I both love our steaks with cream/grain mustard/mushroom sauce, so I’ll just suffer silently, shall I? My heart bleeds for ye! There is a hell of a lot of work to do it. But, I would strongly encourage you to give it a go. The reward is spectacular and has lots of applications. Another great post for my husband and myself. Thank you! Excellent, Conor. Perfection on a plate. That fillet looks outstanding to begin with, it even looks like it may be dry aged? I’d prefer this at 50 degrees, but Kees is with you on the 55. For a teeny bit of additional flavor, you could add the sauce to the pan in which you browned the meat, but only if the browned bits haven’t burned. I like to use clarified butter for the browning part. Of course I agree wholeheartedly on the use of the same good wine for drinking and cooking. Lovely! You are right on the dry ageing. I must give the 50° a shot. Some of min diners would baulk at the prospect. The wine thing is so obvious yet so often ignored. I was transported reading your description. I am re-thinking getting a sous vide device. I am definitely cooking up some demi-glace. I’m looking forward to seeing that shoulder Stefan. Do both. You will regret neither. Beefy winey perfection!! Sounds divine!! You summed it up pretty well! I have a sous vide but haven’t made steak yet! 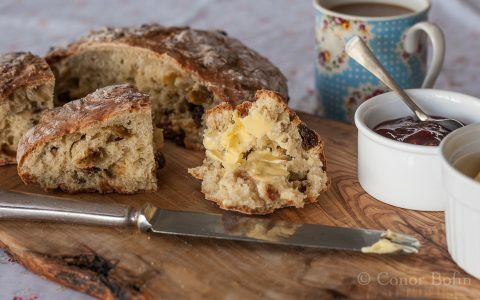 So happy to have another recipe for it! You have to cook this. 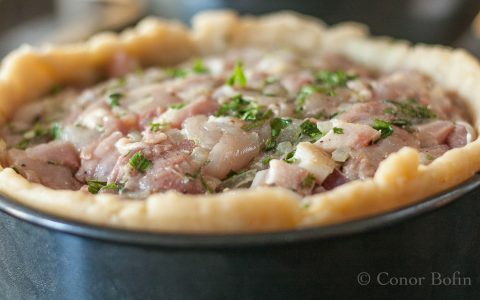 It is quick (for sous vide) and delicious. Thanks for visiting and for the nice comment. 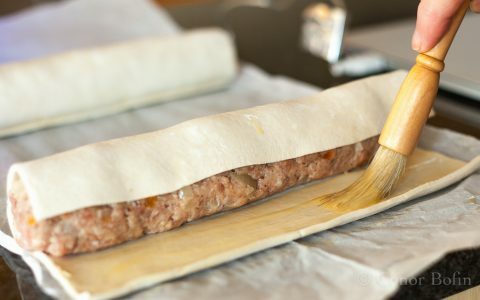 Conor, I pinned about 3 recipes for the sous vide and am so happy that you are posting them. With winter coming, I will bet more familiar with mine. Have a wonderful day! Great that I can be of some help. I have only been at it since last Christmas (a present from eldest daughter) and am really enjoying the output. I suppose you have a post somewhere about making demi-glace? I may be way over my head here, but have some extra hard earned summer money burning in my pocket and once again my thought go to sous-vide goat. Have a look at the Anova Sous Vide range. Not outrageous money and so worth using. There is a link to the previously made Demi-glace up near the top of the post. Perhaps sous vide goat and goat and red wine sauce? That would be an original. Gorgeous. I love your attention to detail. You really feel the joy in your cooking. You are far too kind to me. Though, you are right, I get a lot of fun out of it. Oh Conor, how is it you can make me almost drool on my keyboard at midnight? 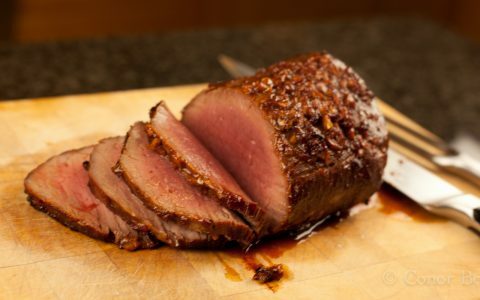 Although I am not a sous vide owner yet, maybe I can convince my hubby to let me buy one, as he seems to have sworn off pork as “you can never cook it right to get it tender.” I do know this was beef tenderloin, though. Anyways, I digress. I have about 4 pounds of beef bones in the freezer (with marrow) from the cow we bought last year. It’s high time I make some of that demi-glace, huh? The pork tenderloin is divine in the sous vide. Tell him to open the wallet. He will never regret it. Great Job Conor! I absolutely LOVE my Sous Vide. Thanks for that. The SV is fantastic and helps raise my game. Wonderful food! I’m confiscating that Susie Voodoo machine of yours C………………………ever try Dunnes Butchers in D.Brook by the way? Not in a long time. Parking is a nightmare. You make me really want to get a sous vide. This looks brilliant! Thanks Amanda. That’s the idea! Very nice, indeed, Conor. 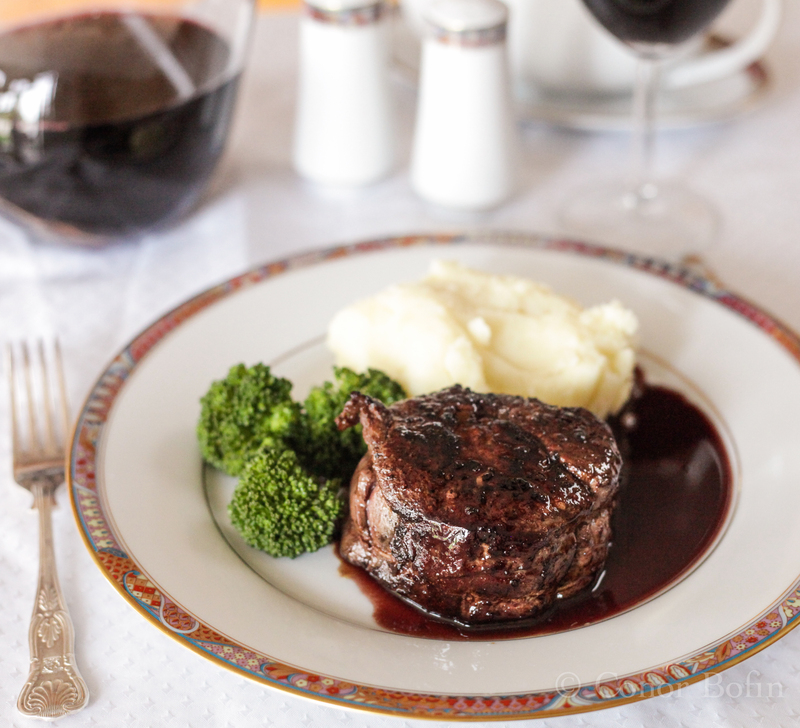 Nice looking Bordelaise sauce and the filet of beef tenderloin is cooked perfectly. Nice plating shot, too. I kept the good plates for this one. It was really, really tasty. 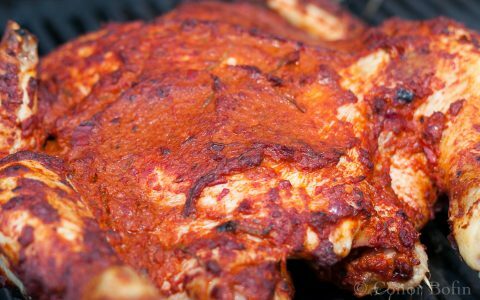 My first smoker post appearing tomorrow. I would welcome your views. Oh my gosh, you’re breaking my heart, here! Wow! Thanks for the very kind words. 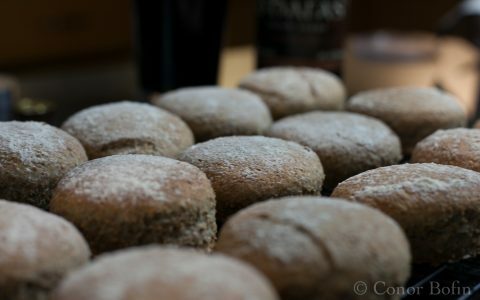 The domestic kitchen feels like a restaurant to me often, with various orders for gluten free, lactose free, fat free and sometimes tasty food, coming in thick and fast. certainly looks like one ! you take orders – you kind kind man! Thanks Tara, the blood was up. Well done should be rare, that’s for sure.